The current version of this article contains a minor change as of May 30, 2013. Back on December 23, I made my first formal attempt at explaining the intricacies of the NBA player contract of Chandler Parsons. As a mere fan (and not an actual NBA insider or team executive), I based that piece on educated conclusions using the information available to me at the time. Unfortunately, only after putting out my prior article was I made aware of additional information that greatly impacts the overall analysis of Parsons’s contract. Hence, the following is a (more informed) analysis of one of the more interesting player contracts in the NBA today. The current version of this article contains a minor change as of May 30, 2013. Back on December 23, I made my first formal attempt at explaining the intricacies of the NBA player contract of Chandler Parsons. As a mere fan (and not an actual NBA insider or team executive), I based that piece on educated conclusions using the information available to me at the time. Unfortunately, only after putting out my prior article was I made aware of additional information that greatly impacts the overall analysis of Parsons’s contract. Hence, the following is a (more informed) analysis of one of the more interesting player contracts in the NBA today. In December 2011, the Rockets signed Parsons to a four-year, $3,629,500 contract (using a sliver of remaining salary cap room they had at the time). Like the contracts previously given to Jermaine Taylor and Chase Budinger, Parsons agreed to bind himself to the team for four years in exchange for an increased salary in the first year ($850,000 instead of the league minimum of $473,604) and second year ($888,250 instead of the league minimum $762,195), both of which are fully guaranteed. Whereas Taylor and Budinger agreed to give the Rockets fully non-guaranteed Years 3 and 4 (together with a team option on Year 4), Parsons and his agent negotiated for additional financial security. By Parsons having not been waived by the Rockets before January 1, 2013, Parsons’s salary for the 2013-14 season ($926,500) became partially guaranteed for $600,000; and if Parsons is not waived by June 30, 2013, his 2013-14 salary becomes fully guaranteed. Furthermore, if the Rockets do not waive Parsons by January 1, 2014, his salary for the 2014-15 season ($964,750) becomes partially guaranteed for $624,771 (the same percentage partial guarantee as in Year 3); and if Parsons is not waived by June 30, 2014, his 2014-15 salary becomes fully guaranteed. The key bit of new information relating to the Parsons contract? It also has a team option on Year 4. This means that, despite having already guaranteed Parsons $624,771 for the 2014-15 season, the Rockets have the right to decline their team option, essentially “eat” that money, and make Parsons a restricted free agent. If the Rockets instead exercise that team option, then when his contract expires in 2015, Parsons will be an unrestricted free agent. 1. Parsons is “stuck” on this contract until at least 2014. First off, there is little incentive for the Rockets to let Parsons out of his dirt-cheap deal. They have him locked up on a very favorable deal for this year and two more after that. For a team trying to manage its cap situation in order to add a second (or even third) star player, giving Parsons a raise before his contract is up in 2015 might jeopardize those plans. And even if the Rockets wanted to give Parsons a raise before 2015, there really is no feasible way to do that without risking his departure to another team (with the possible exception of a renegotiation-and-extension, discussed below). Since only Year 4 of Parsons’s deal is a team option (as per CBA rules, contracts can only contain one option year), there is no way to make Parsons a free agent before 2014 without waiving him. Unfortunately for the Rockets, Parsons is such a good player that there is no way he would clear waivers — other teams would be climbing over each other to get a chance to claim him off waivers. So, unless the Rockets want to give Chandler away to another team without receiving anything in exchange, they need to simply hold onto him on his current deal. At least through next season. Rockets GM Daryl Morey even brings up — perhaps against his better judgment — that Parsons approached the team about restructuring his contract. See Zach Lowe’s interview with Morey here, and skip to the 16:40 mark. 2. An extension of Parsons’s contract is not a viable alternative. First of all, the Rockets would need to be under the cap during the 2014-15 season for this to even be possible. That would mean that the team likely failed in its attempts to acquire a second star player between now and then. It also means that the team did not even use its cap room during the summer of 2014 or at the February 2014 trade deadline to otherwise improve the team beyond 2014. Unless Parsons has developed into a bona fide perenniel All-Star caliber player by that time, there is little incentive to jeopardize the team’s cap situation — and its continued pursuit of that second star player — for the sake of locking up a good (but not great) player. 4. Letting Parsons hit restricted free agency is risky but may be how team does right by him. 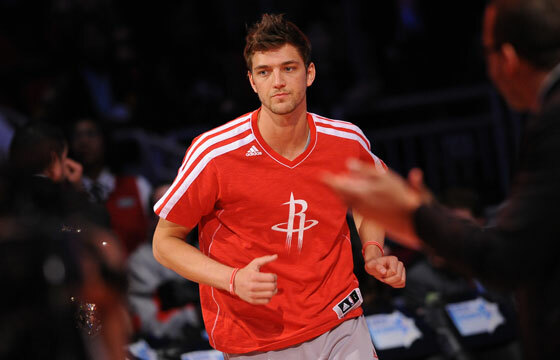 The renegotiation-and-extension route assumes that the Rockets do, in fact, pick up their team option on Parsons. However, if the Rockets (1) didn’t have the requisite cap room available to accomplish a renegotiate-and-extend deal, (2) felt that they could potentially lock up Parsons longer-term at a more reasonable cost through restricted free agency than if he hits unrestricted free agency in 2015 and/or (3) feared that Parsons would hold a grudge against the team if it kept him on his dirt-cheap deal for a fourth season, then they might opt to decline Parsons’s team option and allow him to hit restricted free agency in 2014. Because Parsons would have been under the same contract with the Rockets for three seasons (2011-2014), the Rockets would have full Bird rights on Parsons and could exceed the salary cap to re-sign him to a five-year deal at any amount (up to a “James Harden-level” max contract). Presumably, this option would only be explored if the team had already used up most of its cap space to add a second star player or other significant pieces. Making Parsons a restricted free agent would likely be a huge show of good faith on the Rockets’ part, but it would not be without great risk. Many of us remember what happened to the Cleveland Cavaliers back in 2004. The Cavs decided to do Carlos Boozer a solid and decline their cheap team option in order to make Boozer a restricted free agent, looking to lock him up long-term. Unfortunately, once Boozer became a free agent, the Utah Jazz swooped in with a huge contract offer. Boozer bolted Cleveland for greener pastures, and the Cavs were left holding the bag. Also, from a pure numbers standpoint, it is unlikely that the Rockets could save enough money over the course of a new deal with Parsons signed in 2014 — either with Houston or in an offer sheet with another team — versus one he signs as an unrestricted free agent in 2015 to justify foregoing the opportunity to keep Parsons at his currently-scheduled $964,750 salary for 2014-15. Remember, if the Rockets decline their team option, Parsons would still pocket $624,771 from Houston (which would count against the cap) on top of whatever he could get in free agency. However, if the Rockets are confident that Parsons would work with them on a reasonable long-term deal without bolting as a free agent, their show of good faith may be reciprocated, to everyone’s advantage. 5. Letting Parsons hit free agency in 2015 may best help the Rockets’ cap situation. Notwithstanding the potential benefits above of taking care of Parsons in 2014, the fact that the Rockets (even with the addition of another significant piece in the next three years) might possibly have substantial salary cap room in 2015 means that there may be much to be gained by exercising that team option, keeping Parsons on his contract for a fourth season, and letting him hit unrestricted free agency in 2015. Admittedly, this approach will involve asking Parsons and his representatives to trust in the organization to do right by Parsons once the dust settles on the team’s other summer plans. This may be a tough task, given that the team will have already foregone the chance to do right by Parsons in 2014 by picking up its option on the fourth season. Parsons’s agent will certainly market his client around the league to gauge his “fair value” as a free agent, so numbers would likely be discussed while other plans play out. Barring a trade, the Houston Rockets and Chandler Parsons are stuck with each other under his current contract until at least 2014. An apparent victory for the player at the time of its original execution, the contract is now one of the most team-friendly in the entire league. The Rockets have Parsons locked up until 2015 for a mere pittance. They also have the option to either make Parsons a restricted free agent in 2014 or keep him around for a fourth cheap year and let him hit unrestricted free agency in 2015. Parsons’s low salary (and his cap hold in the summer of 2015) will position the Rockets nicely to continue to add significant pieces over the next several years.